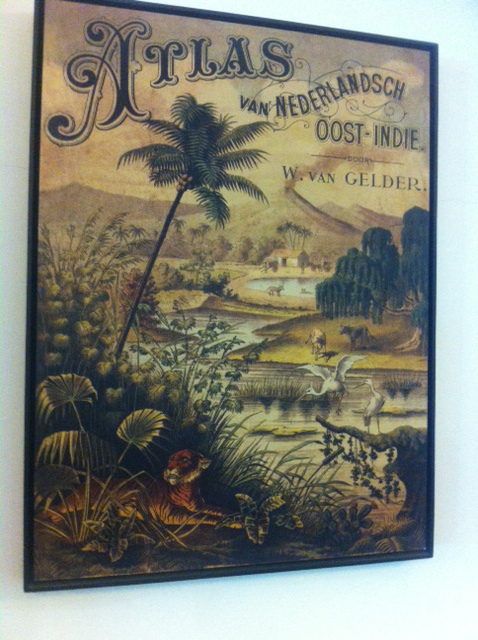 Once we’d decided to cut Sumatra out of our itinerary, we actually had a few days to spare in Jakarta. We made the most of them with some fantastic coffee finds, bringing together all sorts of reasons for liking a coffee shop. Most people in the west will have come across Java coffee or Sumatran, but once you’re in Indonesia, expect to be hit with the subtleties of coffees from East or West Java, from South or North Sumatra (Aceh being a popular coffee source tragically associated in my mind with the tsunami 10 years ago, but not usually thought of as a coffee region on the northern tip of Sumatra), and then the wonderfully exotic Papua, Flores, Bali or Sulawesi. We may only have gone to Java and Bali on this journey, but our appetite has been whetted for future trips to other islands, for the tea as well as the coffee. Indonesia, we’ll be back! 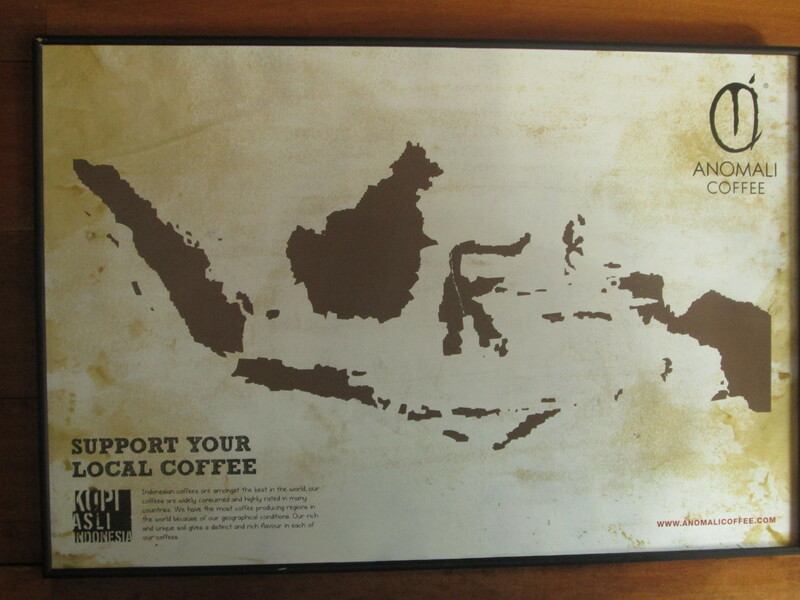 Our first experience of coffee in Jakarta was actually our favourite. 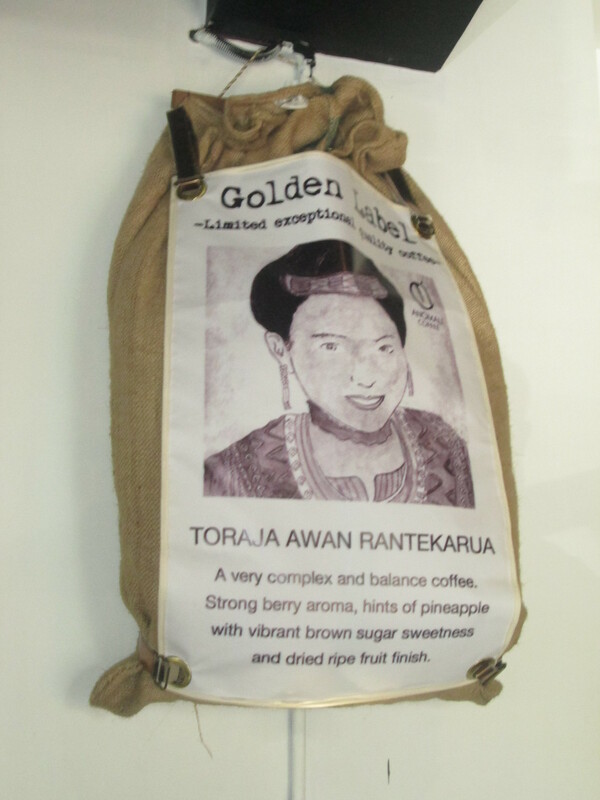 Tanamera Coffee has everything I look for in a coffee shop: friendly, welcoming staff, coffee roasted on-site, a good vibe and buzz from happy customers, not to mention good air con to escape the Jakarta heat and excellent wifi. Oh, and the coffee, was exceptionally good, too. 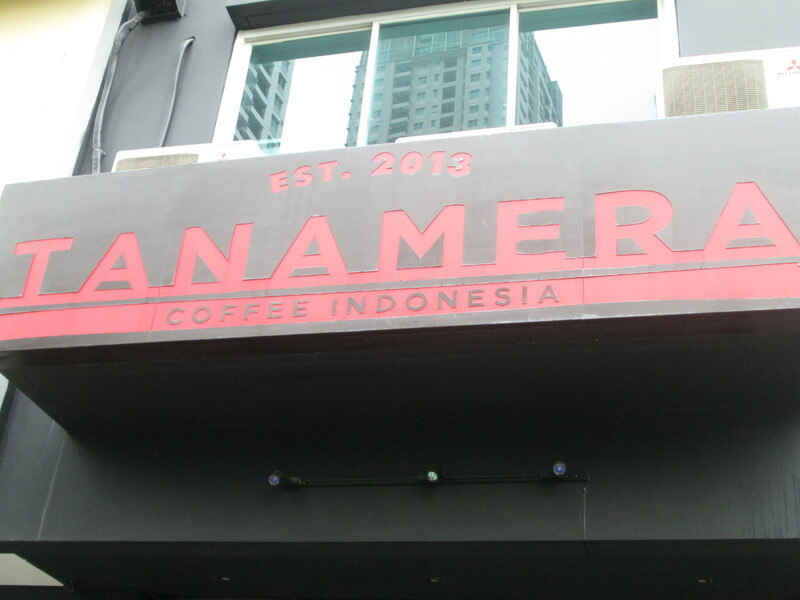 Once you find Thamrin City Office Park, you can’t miss Tanamera. And if it’s anything like the day we were there, you’ll see a crowd of people outside sipping their coffee. It’s a mixed crowd, by the way, with as many westerners as locals, so word has got around the community clearly without the need for bloggers like us! 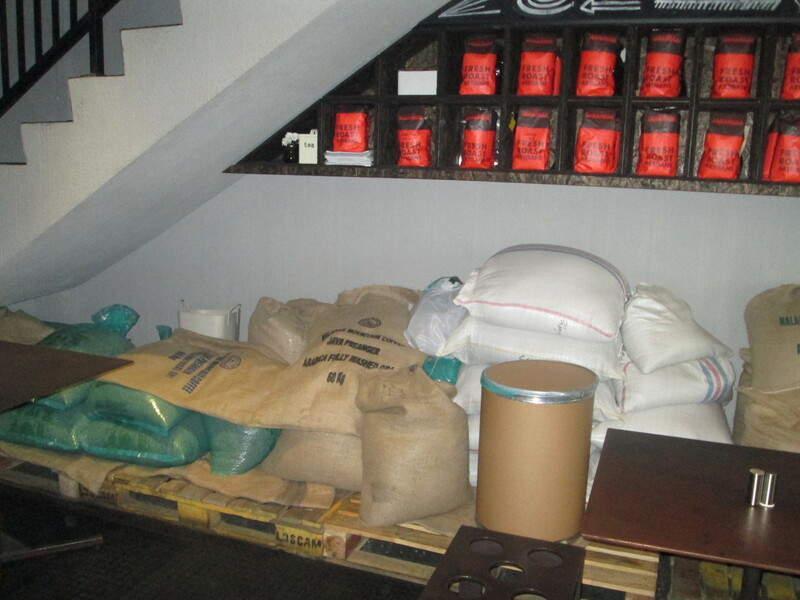 All the coffee on offer was sourced direct from the farmers, all over Indonesia and roasted at the back of the premises here. You could choose between a single origin or a blend for the espresso machine. We loved this place and lingered for much longer than we would normally (partly due to the torrential rain that began to fall shortly after we arrived, forcing us to order a second coffee). 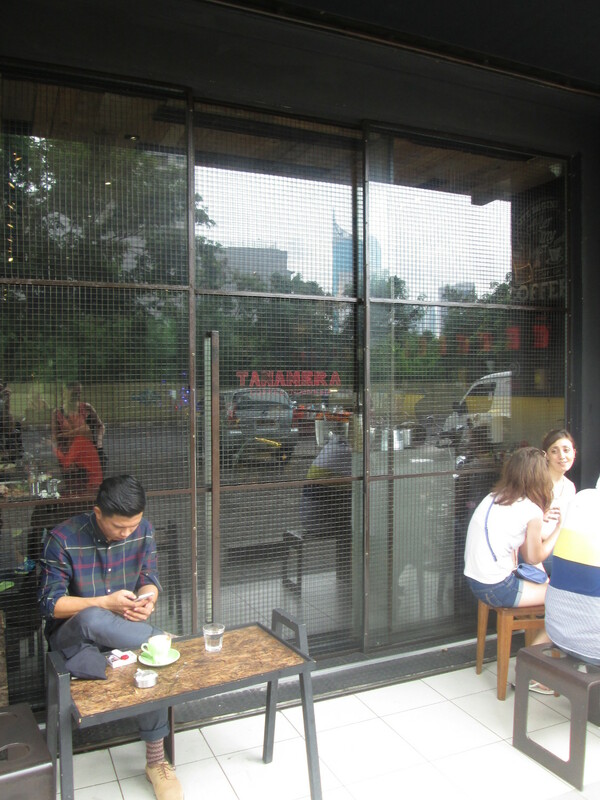 A really good coffee shop in Jakarta. Thanks to Aga for making us welcome (and thanks to Aidan the Aussie from WA who we didn’t get to meet, but who had the idea of setting this place up in 2013. Bakoel coffee shop doesn’t appear in most people’s ‘top coffee shops in Jakarta’ lists, but we loved the place just for its sense of history. 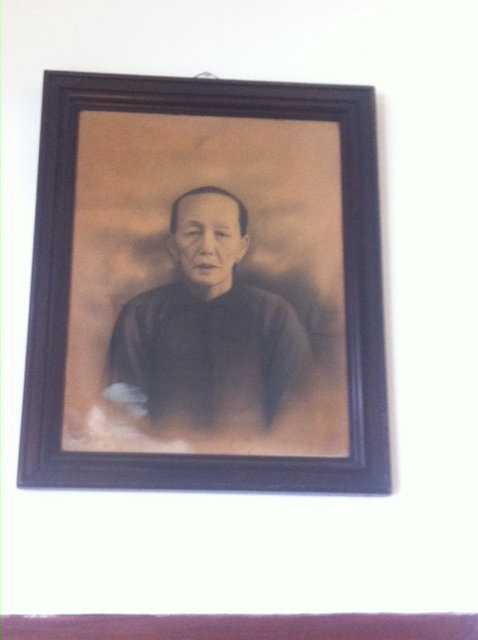 It was founded in 1878 by a guy called Tek Sun Ho, whose portrait still stands proudly on the wall of their branch in the leafy district of Cikini. 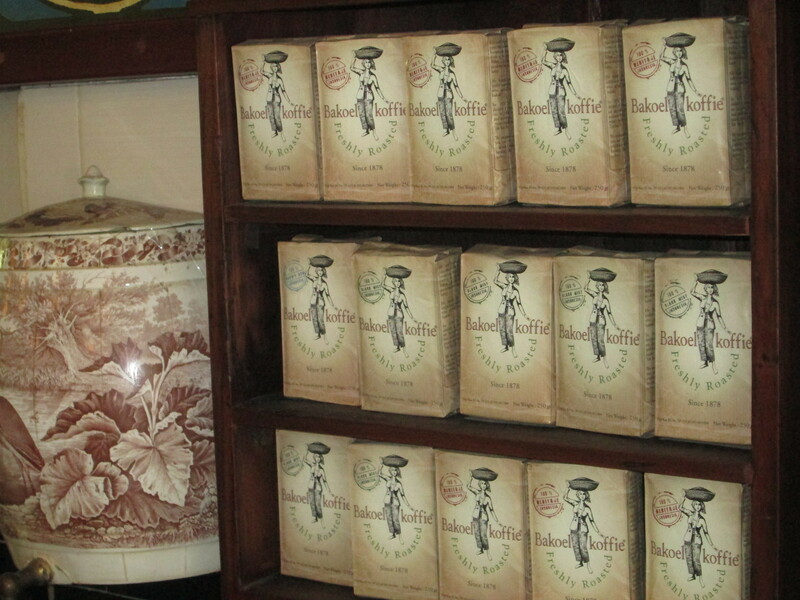 It has a Dutch name (Bakoel Koffie) and makes the most of its Dutch colonial past, with photos of the coffee shop from 1920 and 1938. 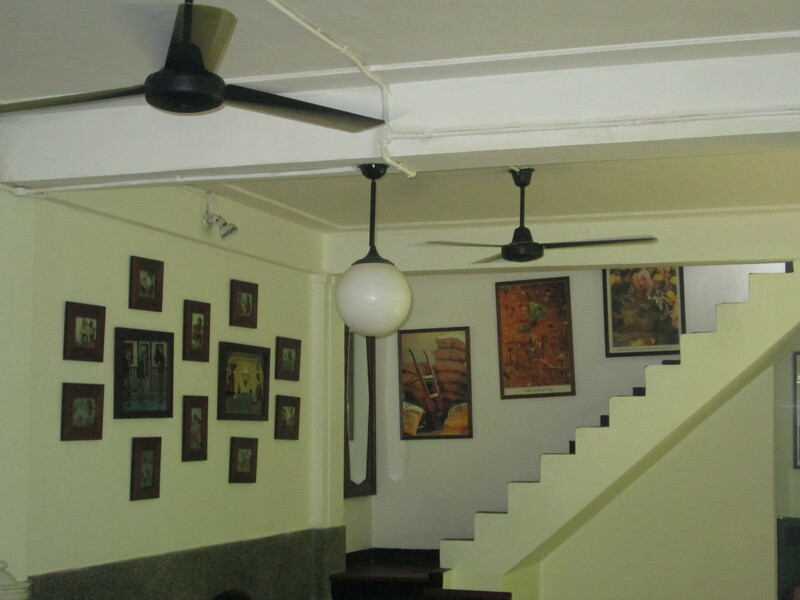 The building still has a colonial feel, with ceiling fans rather than air conditioning, a leafy garden at the back and lots of old coffee making equipment around the place. We don’t usually review coffee shops that are chains, preferring the individuality of the small business run by its owner or at most a place with two branches. 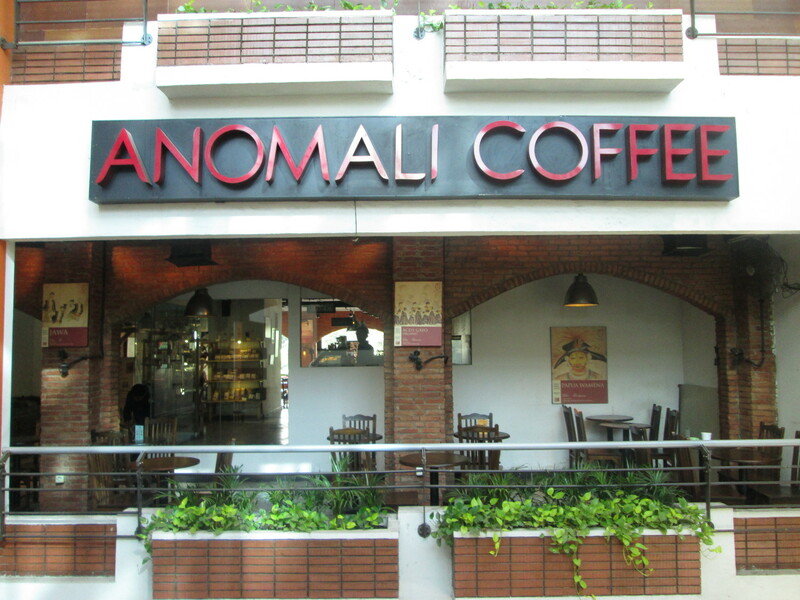 But in Jakarta, there are several local chains, and we came across Anomali Coffee because we needed an early start one morning and these guys open their doors by 7am. 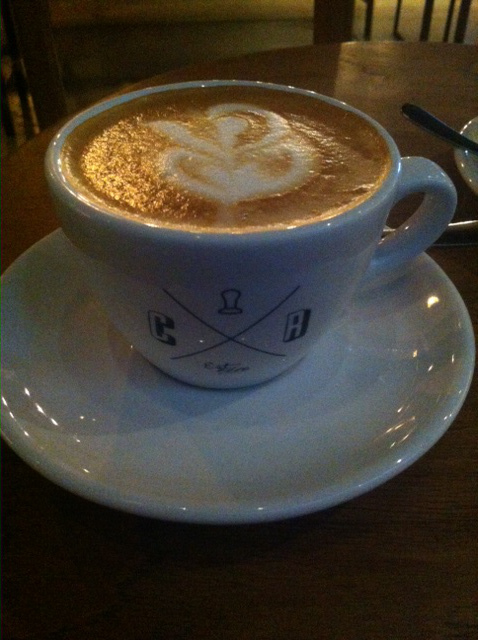 The coffee was good, the atmosphere perhaps a little too big and urban for my liking, but I did love their branding. These guys have the best designers for the packaging of their coffees, so good that we bought a small pack of their Aceh beans to bring home with us. On our last afternoon in Jakarta, and on our way to afternoon tea (but more on that on the tea in Jakarta blog tomorrow), we stopped by Crematology in Jalan Suryo. 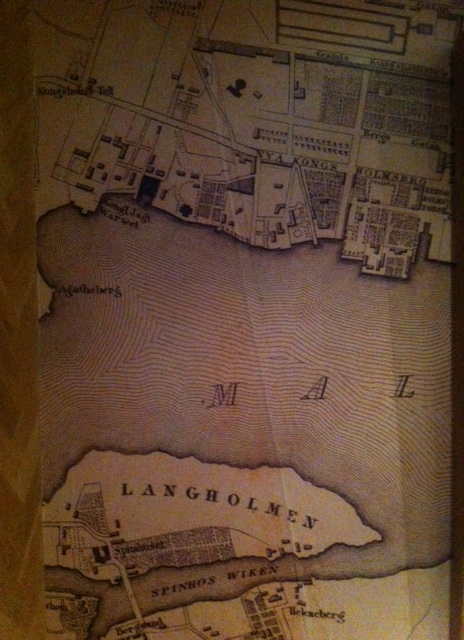 The coffee here too was excellent, the venue spacious and relaxing, but my curiosity drew me to the wallpaper over by the bar, which appeared to be a map of Stockholm, all in Swedish. As I was paying, I casually asked why they had a map of Stockholm on their wall, and the barista suggested I ask the owner, who was sitting just by the wall. 20 minutes later (and by now running late for that afternoon tea…) I was still chatting with Elliot Davernas, the Swedish guy who set up the Crematology concept. 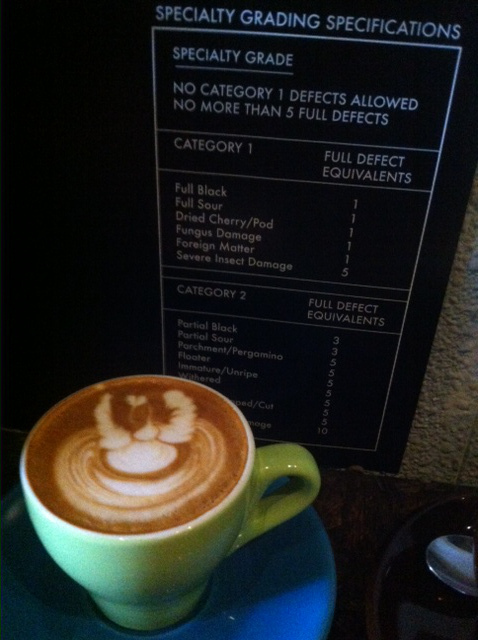 If you like an ethical approach to your coffee, Crematology has to be the choice for coffee in Jakarta. Elliot has a hands-on approach to managing this coffee shop, and prides himself on prioritising home-made rather than factory produced, even for the furniture that fills the coffee shop. In fact, one week from the opening of this place, he told us, they didn’t even have a bar to work from because Elliot wanted all hands on deck to MAKE the bar from the solid block of wood he had acquired – all part of the team-building spirit that makes this one of the most egalitarian places to work in Jakarta, with jobs rotated regularly and everyone able to do anything to keep the place running. Elliot’s passion is not only contagious, it’s addictive. I reckon even I would have joined in with the furniture making if I’d been on his team, though I’m not sure they’d have had such a smooth surface if I’d put the finishing touches to it. It’s a shame I didn’t have time to try more of the coffees and cakes on offer here at Crematology. But I’m really glad I asked why they had that map of Stockholm on the wall. 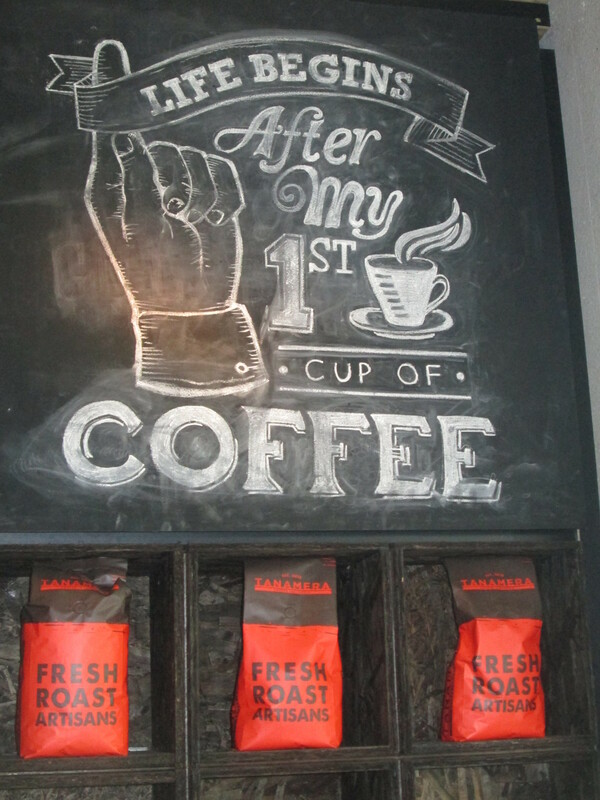 After all, I always liked a coffee shop with a good story to tell. And Elliot can certainly tell a few of those.